These notes on Luxembourg restaurants come from my trip there in autumn 2007. I did not have time to visit the capital on this occasion, just the vineyard region of the Moselle, to the south-east of the country close to the German border. In fact, the restaurants of Luxembourg have more Michelin stars per capita than any other country, and this small glimpse of the country’s dining scene certainly whetted my appetite to return. Lea Linster is Luxembourg’s most famous chef and all-round media personality. I enjoyed a terrific 10-course meal at her one-star restaurant in the village of Frisange, southwest of the Moselle wine route. 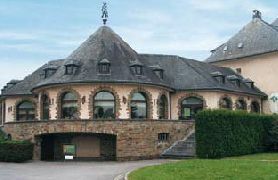 The dining space is large and airy, with a lovely terrace at the back offering views of the Luxembourgish countryside. After various canapés and amuses, small courses began with une petite soupe servie comme un cappuccino, followed by a terrine of hare that was beautifully chunky, the meat so soft it was almost foie-gras-like, with a dense, dark little confit in the centre. A plate of roasted summer vegetables followed that was incredibly simple, but delicious, with olive oil-roasted peas in the pod, fennel, courgette and potato. One stand-out dish was a risotto served with frogs legs (right) that was creamy and rich with a herb and balsamic reduction. A warm salad of lobster was beautiful, with a really light, fresh sauce and plenty of lobster meat, doused with little discs of radish and sweet peas. “Oeuf en surprise au caviar imperial” followed, the ‘surprise’ being vodka, which had been whipped with cream, lemon and poached salmon and made into a mousse within the egg-shell. Confit of Icelandic salmon was served with a puree of petit-pois, which had been enriched with meat stock or something meaty and slightly smoky. The ‘main’ course was saddle of roe deer that was chocolaty in its density and texture, melting in the mouth with a very dark, rich sauce and caramelised sweet pears.Finally (although fresh-baked madeleines and chocolates followed) I loved the dessert (left), a chunk of pineapple, roasted to a toffeed richness and served with a sensationally good milk ice cream. The wine list is long and and features both the best local wines and a very good French selection. A slightly shorter, six-course version of this tasting menu. costs 90 Euros per person, and the restaurant is open Wednesday to Sunday, though lunch Wednesday to Friday is by appointment only. This newly-renovated restaurant faces the river Moselle in the village of Stadtbredimus. Chef is Jean-Marie Hemmen, who came form Lea Linster’s kitchens to take over here. The restaurant is owned by Vinsmoselle, the giant of the Luxembourg wine industry, so only their wines are sold – but that includes excellent Crémants like the Poll-Fabaire, and I can thoroughly recommend the wines in the ‘Art et Vin’ series. This is a beautiful, circular dining room, flooded with light and arranged around a busy central bar area. The food here is regional and seasonal, and was extremely good. I enjoyed an excellent fillet of beef (Luxembourg’s cattle are a very happy bunch, enjoying plenty of space in all-grass pastures), and my dessert of freshly picked mirabelle plums, served hot in their own syrup with a scoop of mirabelle sorbet, was a fantastic dish. Around 35 Euros for three courses. Closed Monday and Tuesday. Not in the ‘fine dining’ camp, but a very good option in the bustling wine route village of Remich, this is the restaurant of the Caves Saint Martin winery, one of the most visited of Luxembourg’s wine domaines, thanks to its extensive underground caves for the maturation of sparkling wines, in a similar style to France’s Champagne region. The restaurant has a broad terrace facing the river, but I ate in the busy dining room. This is traditional, no-nonsense Luxembourgish fare, and I enjoyed a plate of a local speciality, Moselle Fish. A bit like slightly larger whitebait, these are small battered fish from the river, deep-fried whole and served with plenty of fresh lemon. Prices are modest (around 25 Euros for three courses) and there is a good list of Luxembourg wines.